Being surrounded with exciting art not only at home but also in the workplace is an enrichment for both management and staff. Art can provide a framework for an innovative and creative environment and inspire new thoughts and viewpoints during a working day. GALLERI V58 has an extensive experience with exhibiting in enterprises and institutions and can thus assist you with the selection of artworks which would fit your corporate identity, brand, and values. Whether the final effect should be discreet, dynamic, or somewhere in between, we can always provide a solution. 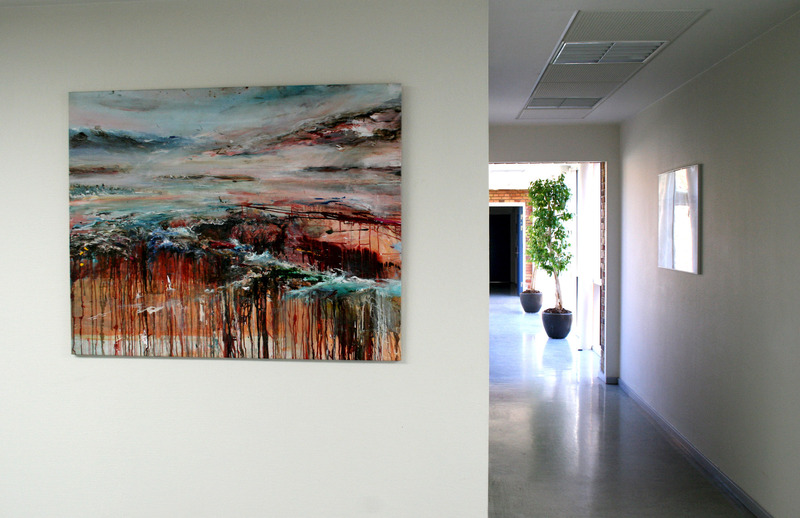 We offer an art rental system that is flexible and can always be adjusted to fit the needs of individual clients. During a free noncommittal visit to your company we can together determine what might be interesting for you and provide you with a non-binding offer. We have developed a model that allows for transferring a part of the monthly rent to the company’s own bonus/purchase account. This way we provide you with a convenient and advantageous opportunity not only to have varying exhibitions in your company, but also a possibility to acquire interesting art. Also, do not forget that a purchase of artworks can be written off as a business expense. We hope that this offer has awoken your interest, and we look forward to hearing from you. You can call us, email us, or stop by the gallery for an informal talk.